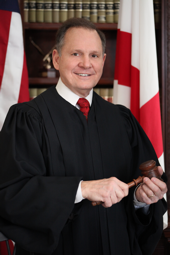 Rational Press (RP) – Alabama Chief Justice Roy Moore is today’s winner of the Legion of Dishonor Award for his open defiance of Constitutional law; specifically for his history of disregard for, or his ignorance of the intent of the Establishment Clause of the 1st Amendment to the Constitution of the United States, and of the Equal Protection Clause of the 14th Amendment. He is hereby inducted into the National Hall of Injustice. The federal courts have virtually always come down on the side religious freedom for everyone, but that freedom gives no one a right to compromise the freedom of others, e.g., freedom of conscience and the right to pursue happiness according to the dictates of conscience. All citizens must be equal before the law, and any law, based on religious conviction, inherently relegates some citizens to second-class status. Freedom of religion does not mean freedom for adherents of one religion to rule over adherents to other religions, or to rule over those who adhere to none at all. [The] impious presumption of legislators and rulers, civil as well as ecclesiastical, who, being themselves but fallible and uninspired men, have assumed dominion over the faith of others, setting up their own opinions and modes of thinking as the only true and infallible, and as such endeavoring to impose them on others, hath established and maintained false religions over the greatest part of the world and through all time: That to compel a man to furnish contributions of money for the propagation of opinions which he disbelieves and abhors,4 is sinful and tyrannical . . . Still, Moore isn’t entirely to blame. His religious tyranny is reflective of the will of ignorant voters who tend to elect such pompous, self-righteous, and/or ignorant men to high places. A reward well deserved for a true a-hole and idiot. Too bad such idiots have such power. Quite correct! It is a real statement about the education level of the majority of the voters in Alabama. I wonder why these guys do that. Do they really believe what they’re doing? Do they think their constituents do so they will be more likely to get reelected? We live in a really weird world when stuff like this happens. It is difficult to fathom folks who actually obtain an higher education, but do not understand the rigors of the scientific method. It is possible, I suppose, that many take courses that avoid formal and informal logic as well as other science oriented subjects. Last week I began some research on what makes people believe the unbelievable, even in the face of logically irrefutable, contrary evidence. Unfortunately I got sidetracked. I hope to get back to it soon. As for Moore, since judgeships in Alabama are voted on by the public, one can expect to see folks like him rise higher the more he thumps the bible and defies the federal government. Does he know better? I think he does and he is playing the faithful for all its worth. Blind faith makes one an easy mark for shysters. That’s how truly ignorant politicians get elected–although, again, I think most of them know better as well, and are playing the religion card for votes, power, and wealth–not unlike wealthy preachers. That was well said, my friend.